Buenos Dias from Plaza de Mulas, on Aconagua. The highest mountain in South America! We have a great team here getting ready to climb and have had a nice trip up from Mendoza in the transfer van up to Penitentes for one evening on the way to the Park Gate. Our first day of the trip on January 31, was a great time to meet everyone and we basically got most the logistics finished rather quickly, gear checks, a team meeting, some folks went around to rent or buy some items, and then we enjoyed a nice dinner at La Florencia in the town. Our transfer van today took us about 3.5 hours up to the little road stop town known as Penitentes, along the highway that goes to Sanitago de Chile. This is the traditional overnight spot on the way to Aconcagua. That evening we did some repacking of food and group gear while the team settles into the hotel for the night and prepared for the next days trek up to Confluencia on February 2. Confluencia is at 3200m approx. and was in a very striking location near the trail toward plaza francia looking toward the south face of Aconcagua. 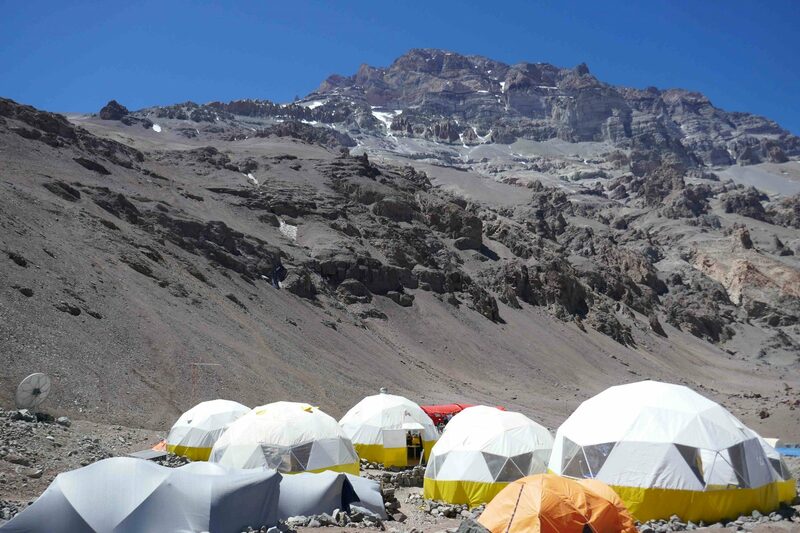 We like to took an additional day at Conlfuencia to acclimatize and did a nice walk and then the following day on February 4 we trekked into the base camp at Plaza de Mulas at 4300 meters in altitude. Today has been a rest day for the team, relaxing with a late breakfast and some showers, checking in back home on the base camp Wifi, and we just did a meeting looking at clothing systems and what to bring up to various camps on the mountain. The remainder of the day will be for relaxing and a quick visit to the park doctor to do the check in, our plan is to do a walk to Camp one tomorrow for acclimatization and return to Base camp, and then have a rest day following that before we start up the mountain. We look forward to another great expedition on the highest peak in South America and we are glad you can follow along on the adventure!